Ahh Scunthorpe, such a lovely place full of factories, chavs and polluted air. 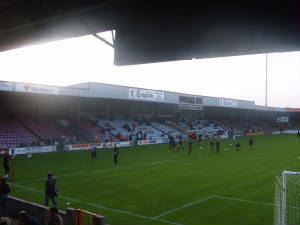 A trip to Glanford Park isn't exactly where most people woudl want to go for a playoff game but it could be a lot worse. 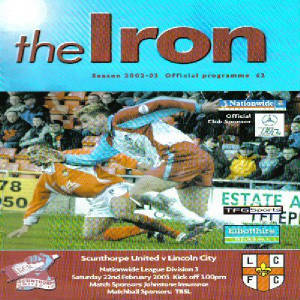 This game took place 4 days after the first playoff game which had ended with a remarkable 5-3 victory for City. 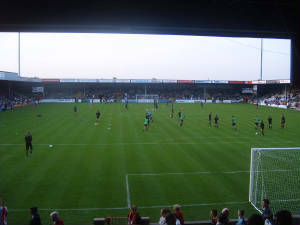 Getting to Scunny is quite easy from Lincoln as it is quite literally just up the roadand getting to Glanford Park is also relatively easy due to it being right on the outskirts of the town. Around the ground there is a fair bit to do with numerous restaurants and a large shopping area just over the road from the ground. Getting into the away, you get a feeling you've entered Legoland because the colour scheme seems like something you're more likely to find with the Lego pirates rather than a football ground. The away end is mixed, although it is a good away and offers a great view of the action, it is incredibly cramped and the seating is very back-breaking. There are also numerous poles in the way but these don't really get in the way of the viewing action. The stands to our left and right are pretty much identical, running the length of the pitch with patches of maroon/purple and sky blue. 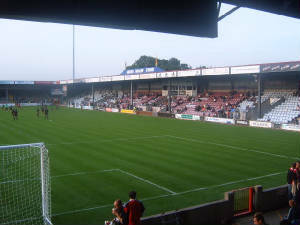 The final stand is a terrace at the other end of the pitch. Atmospherically, Glanford Park is very poor. 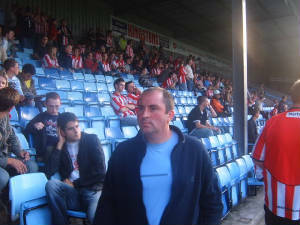 You get all the little chavish hooligans to the right whenever we play Scunthorpe yet you never see them on highlights of other games meaning they aren't proper Scunny supporters, these fans will come out with stuff like "only sing when you're wiinning" even though you'd been singing constantly ages and they had been as quiet as a cemetery. The terrace behind the far goal tries to create an atmosphere but not a lot of people in there seem interested and not a lot of noise is created. Overall, a trip to Scunny is farely enjoyable usually but the lack of atmosphere and the Chavs to the right do spoil it a bit. I would however recommend this ground as a randomer.